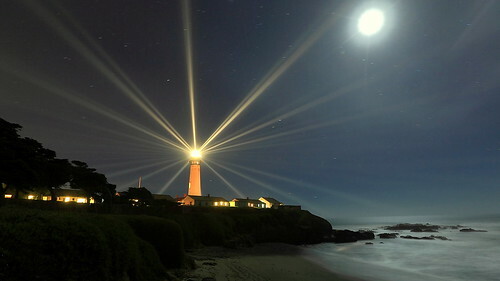 The Pigeon Point Light Station - so named because of the nearby wreck of the ship "Carrier Pigeon" undergoes a once annual lighting ceremony where the very old first order Fresnel Lens is lit. That light, seen radiating out as 24 separate beams slowly rotates so that each beam sweeps a location every 10 seconds. This spectacle really is enjoyable when the weather permits, and when the event is held. It is a sad state, California, where some of our most beautiful resources, places of heritage, and history are sorely strapped for cash. I certainly hope you'll consider making a donation to CalParks.org to help support the maintenance and rennovation of this magnificent structure. This view is facing south. It is a two minute exposure with a 1/2 full moon in the upper right. See the lights rotate and the waves come and go in this YouTube video.